The Australian Excellence Awards Centre has contacted selected customers of Shoulder Guy Physiotherapy to secure feedback and ratings to assess entry into this year’s (2011) awards program. 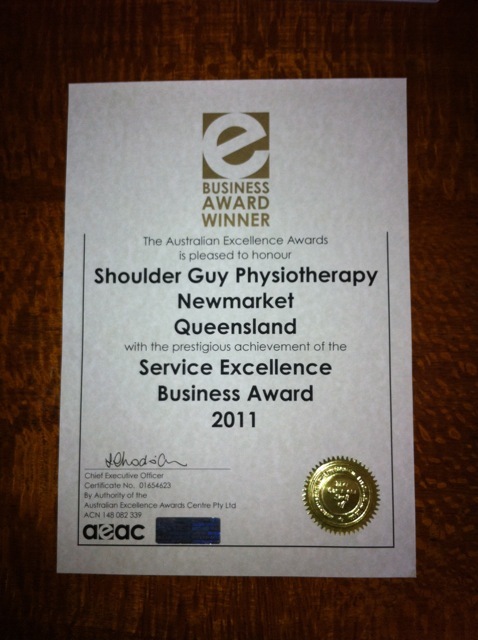 It is a great honour and evidence for the quality of service provided by Luke Van Every (The Shoulder Guy) and the team at Shoulder Guy Physiotherapy that we have been awarded the Service Excellence Business Award for 2011. In short, we scored a customer satisfaction rating of 96.2 points out of 100. Shoulder Guy Physiotherapy was rated on such things as understanding customer needs; being outcome focused; professionalism; reliability; service quality and knowledge and experience. Thanks to all our loyal clients who took the time to rate us. PS: Shoulder Guy has also received an Annual Honours Nomination in the Buisness Category of Service Excellence…so fingers crossed. Now the proof is in the pudding right?… so check out the certificate below.